Bank Rhode Island's new advertising campaign designed for community sponsorship and support. 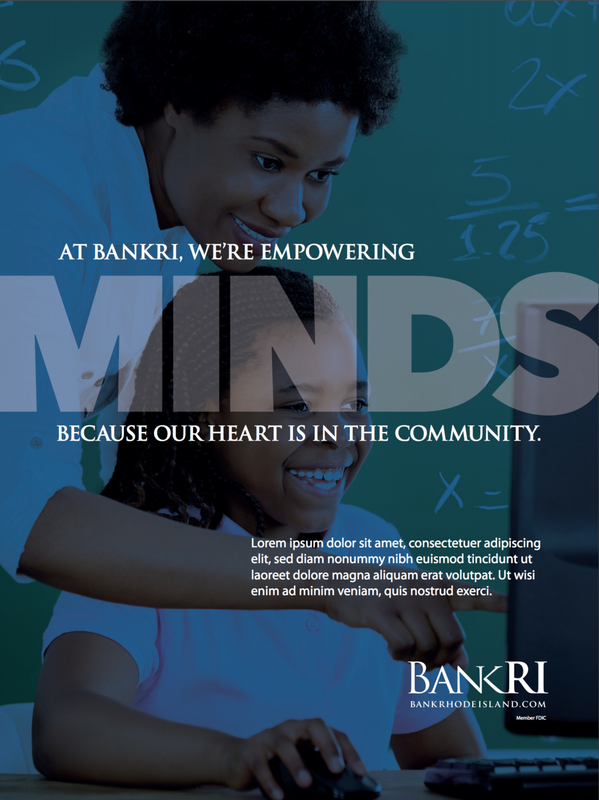 Shark continued BankRI’s 2018 integrated marketing campaign with its newest installation of print media – community ads. A subtle variation on the BIG theme, these ads reinforce the text overlay design concept first introduced by the digital billboard and broadcast TV ads developed by Shark at the beginning of summer. More to come! Downtown Providence, RI Digital Billboard for Bank Rhode Island. Part of Shark's new integrated campaign rolling out in broadcast, print, radio, and outdoor for BankRI, our latest implementation on downtown, digital billboards. A quick client-approved ruff for a new bank ad. Momentum from Shark, for Brookline Bank, Boston, MA. Brookline Bank (BRKL) reports strong 3rd quarter earnings, Wall Street loves it, and great timing with our new "Momentum" business ad. Hot Java for Home Equity. Here's a trio of creative branch posters designed for BankRI. Found: SEM and Digital marketing for Banks. Sweet Home Equity Promotion for BRKL! Fun, colorful and creative new Home Equity ads for Brookline Bank. Yes, we've been busy as a bee. Some new bank advertising for Brookline Bank marketing - time to hug your dog. A new, late summer and early fall bank ad for Boston-based, Brookline Bank, is taking shape and destined for both tradtional and digital media. You can also see Shark's dogs here. Shark hits the beach with summer ads for Brookline Bank. Bank Web development: Responsive Web Design for desktop, tablet, and mobile. Here's some new bank web design - actually, for multiple banks, utilizing html5 animation and integrated into a beautifully responsive template. We've also integrated additional panels below on the homepage for better display of key content. Infographic Design: Beautiful hands-on design for Eastern Funding. Gotta hand it to Christian for some fast, well-organized inforgraphic design. Eastern Funding is a NYC-based finanical company and longtime client of Shark that just hit the $1 Billion mark in funding. Shark Communications' bank brand advertising for Brookline Bank takes a new turn. With strong customer relationships at the heart of Brookline Bank's strategic focus, Shark's marketing for the bank has been far more heavily weighted towards brand image marketing versus product or service-specific advertising. After a long spring and summer of creative development, we've given Brookline Bank's highly successful brand advertising campaign and evolutionary twist with new graphics and concepts. The "Car" ad starts the new campaign. Digital marketing for more Business Banking customers: The small business microsite. We are stepping outside of the physical branch to help the Bank of Rhode Island develop lead generation strategies online for business banking. Although this site has now been shifted by the client to be commercially-focused, this early draft of the home page is a nice example of a targeted online destination for business customers. Bank Marketing - Shark Creates a hands-on, proactive image with new business banking ads.